On Thursday 29th October 2015, the German artist Ulrich Rückriem (b. 1938) opened a new exhibition at Annely Juda Gallery in London. The show consisted of three large scale sculptural works and one 30-part work on paper. In contrast to the formal installation of these works, there was also a small postcard sized pencil and crayon drawing on paper stuck directly to the back of a door, unframed and unadorned. Chelsea Space Director, Donald Smith, questioned the artist about this intriguing piece and Rückriem answered that he drew every day and this was one of the drawings done that day. Smith explained this story to two of his MA Curating and Collections students, Xinyan Wang and Ying Ying Yang, who were also at the private view, and encouraged them to undertake some original research and question him further about these drawings. The two students left the exhibition for approximately ten minutes then came back with a questionnaire and proceeded to interview the artist during his private view! 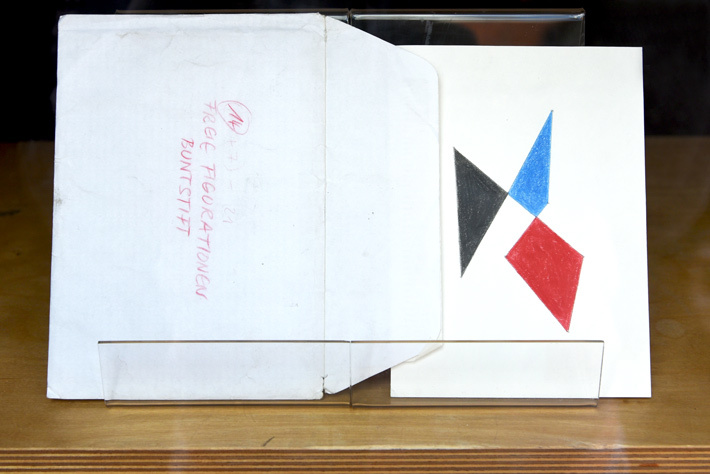 Later in the evening at a dinner, Ulrich Rückriem passed Donald Smith a small envelope containing seven drawings and said "I enjoyed talking about my drawing with you and your students this evening, I would like you to have these". These drawings are based on a grid of 7 x 7 horizontal and vertical lines. They start with seven dots, between which the artist then draws lines in such a way that each of the seven horizontals and seven verticals are only used once. The resulting patterns are then coloured-in with crayon in black, white and primary colours. In a conversation with Peter Lodermayer in 2007 Ruckriem explained that he finds endless possibilities and a kind of Taoist speechlessness in these drawings which he intends to continue until the end of his life.